The effect of this “mechanical diffraction” allowed researchers to observe how the snakes’ trajectories were altered through passive mechanisms governed by the skeletal and muscular dynamics of the animals’ propagating body waves. The researchers studied live snakes as they slithered through an obstacle made up of six force-sensitive rigid pegs that buckled the animals’ bodies, changing their paths in predictable ways. The colorful shovel-nosed snake normally uses a sinusoidal S-shaped wave to move across the deserts of the Southwest United States. Running into rigid pegs in a laboratory environment doesn’t lead it to actively change that waveform, which Schiebel and colleagues studied using high-speed video cameras with eight different animals. In a study supported by the National Science Foundation, Army Research Office, Defense Advanced Projects Agency, and a National Defense Science and Engineering Graduate Fellowship, the researchers used 253 snake trips to build up a diffraction pattern. Remarkably, the pattern also revealed that the scattering directions were “quantized” such that the probability of finding a snake behind the array could be represented in a pattern mimicking wave interference. 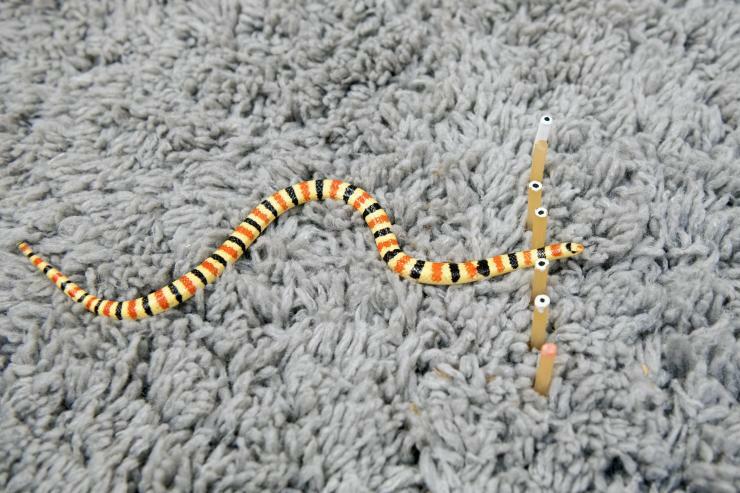 A computational model was able to capture the pattern, demonstrating how the snakes’ direction would be altered by obstacle encounters via passive body buckling. 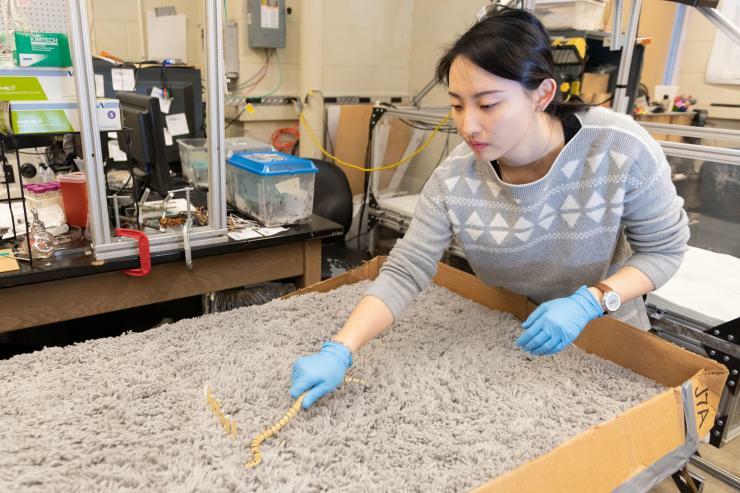 Experimentally, the researchers used a “snake arena” covered with shag carpet to mimic sand. 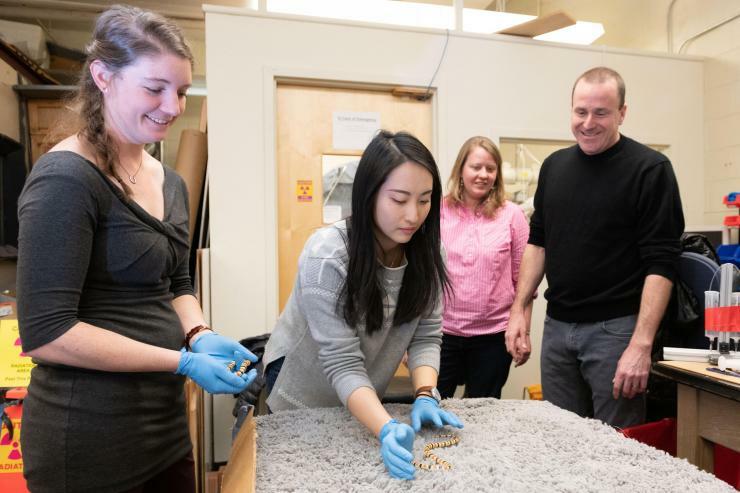 Undergraduate students Alex Hubbard and Lillian Chen released the snakes one at a time into the arena and encouraged them to slither through the grating. The eyes of the desert snakes are naturally covered with scales to protect them. The researchers used children’s face paint to temporarily “blindfold” the animals so they would not be distracted by the researchers. The paint did not harm the animals. This work was supported by National Science Foundation Physics of Living Systems program awards PHY-1205878, PHY-1150760 and CMMI-1361778; by the Army Research Office through award W911NF-11-1-0514; U.S. DoD National Defense Science and Engineering Graduate Fellowship (NDSEG) 32 CFR 168a; and by the Defense Advanced Research Projects Agency (DARPA) Young Faculty Award. Any opinions, findings, and conclusions or recommendations expressed in this material are those of the authors and do not necessarily reflect the views of the sponsor organizations. CITATION: Perrin E. Schiebel, et al., “Mechanical diffraction reveals the role of passive dynamics in a slithering snake,” (Proceedings of the National Academy of Sciences, 2019).